Narrow rectangular butter dish with cover. Backstamp: Baltic Adams Real English Ironstone Est 1657 England Micratex Decoration completely underglaze acid and detergent proof. There is a little wear to the rim of the base and to the inside rim of the cover some stress marks. Pretty little dish. Small scratch to rim, otherwise fine. Blue printed backstamp. Lovely small round dish. It has a little minor wear to the rim otherwise excellent condition. With gilt. A lovely little dish with central divide from the breakfast in bed set. The gilt is a little worn and there is a small glazing blemish inside on the white area otherwise fine. Blue printed backstamp: Booths Silicon China Made in England. Delightful little dish with central divide and ochre rim. Backstamp: Booths Silicon China Made in England Pagoda These Colours Will Not Perish and in script 2511. There is a little minor wear and touch of discolouration to the outer rim, central divide and underneath to the foot otherwise excellent condition. With gilt. Delightful little dish with foot rim. Backstamp: Booths Made in England Real Old Willow A8025. Excellent condition. With gilt. Delightful little dish. Backstamp: Booths Made in England Real Old Willow A8025. Excellent condition. With gilt. A delightful small square dish for an individual serving of butter. Backstamp: Booths Made in England Real Old Willow A8025. A little minor wear to the gilt otherwise excellent condition. With gilt. Backstamp: Booths Silicon China Made in England Real Old Willow From the breakfast in bed set. Small round dish with a central divide. It has some wear and discolouration underneath mainly to the rim and also a little wear to the gilt otherwise excellent condition. Provenance: The Entwistle Collection. With gilt. Backstamp: Booths Silicon China Made in England Real Old Willow, impressed Booths and date for 1926. An absolutely gorgeous round butter dish on fixed stand with cover. The gilt is worn on the stand and there is a little discolouration under the rim of the cover but overall stunning. Provenance: The Entwistle Collection. Lovely small round dish and cover. Backstamp: Royal Leighton Made in England May Blossom. Crazed otherwise in excellent condition. The depth of colour between base and cover varies. Made in England. Brand new and first quality, dishwasher and microwave safe. Black Arden. This item has been discontinued by Burleigh and is no longer available. Made in England. Brand new and first quality, dishwasher and microwave safe. Black Arden. Rectangular tub type with flat cover. This item has been discontinued by Burleigh and is no longer available. Made in England. Brand new and first quality, dishwasher and microwave safe. Brown Arden. This item has been discontinued by Burleigh and is no longer available. Made in England. Brand new and first quality, dishwasher and microwave safe. Brown Arden. Rectangular tub type with flat cover, holds about 1lb of butter. This item has been discontinued by Burleigh and is no longer available. Rectangular tub type dish with cover made especially for The National Trust. Backstamp: Burleigh Collection The National Trust Working to sustain handcrafted English pottery England. There is discolouration underneath the lid otherwise excellent condition. Made in England. Brand new and first quality, dishwasher and microwave safe. Black Asiatic Pheasants. Rectangular tub type with flat cover. This item has been discontinued by Burleigh and is no longer available. Made in England. Brand new and first quality, dishwasher and microwave safe. Brown Asiatic Pheasants. This item has been discontinued by Burleigh and is no longer available. Made in England. Brand new and first quality, dishwasher and microwave safe. Brown Asiatic Pheasants. Rectangular tub type with flat cover. This item has been discontinued by Burleigh and is no longer available. Made in England. Brand new and first quality, dishwasher and microwave safe. Blue Bird. Rectangular tub type with flat cover. This item has been discontinued by Burleigh and is no longer available. Made in England. Brand new and first quality, dishwasher and microwave safe. Dark Blue Calico. This item has been discontinued by Burleigh and is no longer available. Dark blue Calico, made in England by Burgess and Leigh. Backstamp: Royal Crownford Calico Staffordshire England. The cover has light crazing and inside blue spotting, otherwise excellent condition. 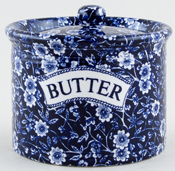 Round butter dish with cover and the text BUTTER on the outside. Backstamp: Calico Burleigh Staffordshire England. A little minor wear underneath otherwise excellent condition. Made in England. Brand new and first quality, dishwasher and microwave safe. Black Calico. This item has been discontinued by Burleigh and is no longer available. Made in England. Brand new and first quality, dishwasher and microwave safe. Black Calico. Rectangular tub type with flat cover. This item has been discontinued by Burleigh and is no longer available. Made in England. Brand new and first quality, dishwasher and microwave safe. Pale Blue Calico. Rectangular tub type with flat cover. This item has been discontinued by Burleigh and is no longer available. Made in England. Brand new and first quality, dishwasher and microwave safe. Pale Blue Chequers. This item has been discontinued by Burleigh and is no longer available. Made in England. Brand new and first quality, dishwasher and microwave safe. Pink Felicity. This item has been discontinued by Burleigh and is no longer available. Made in England. Brand new and first quality, dishwasher and microwave safe. Blue Heritage. Rectangular tub type with flat cover. Calico border pattern around the base and lovely bird detail on the cover. This item has been discontinued by Burleigh and is no longer available. Made in England. Brand new and first quality, dishwasher and microwave safe. Blue Polka Dot and Rose. This item has been discontinued by Burleigh and is no longer available. Made in England. Brand new and first quality, dishwasher and microwave safe. Pink Polka Dot and Rose. This item has been discontinued by Burleigh and is no longer available. Made in England. Brand new and first quality, dishwasher and microwave safe. Blue Prunus. This item has been discontinued by Burleigh and is no longer available. Made in England. Brand new and first quality, dishwasher and microwave safe. Blue Prunus. Rectangular tub type with flat cover. This item has been discontinued by Burleigh and is no longer available. Made in England. Brand new and first quality, dishwasher and microwave safe. Black Prunus. Rectangular tub type with flat cover. This item has been discontinued by Burleigh and is no longer available. Made in England. Brand new and first quality, dishwasher and microwave safe. Brown Prunus. This item has been discontinued by Burleigh and is no longer available.